While suitcases were often packed and transported, a garb that was constant was the garb of art. It served simultaneously both as her physical and inner world. Art was uninterrupted. Throughout the years, Haia married, raised children worked and studied. As significant, was the struggle to not only create, but also to convey a sense of meaning through the visual arts, thereby connecting to the viewer. It is a process that has led Haia to believe that one does not choose to make art insofar as one does not choose to breathe. Haia creates art because it is who she is, like an inseparable twin sibling. Currently, Haia is drawn to materials that interact with each other on surfaces. They don't stand alone, but rather engage with each other hopefully leading to layers of textures and personal meaning, all the while drawing the viewer in. Haia has taught and studied visual arts for many years emphasizing not only technique but also inner connection to meaning. Haia has exhibited, and past works are held in private collections. 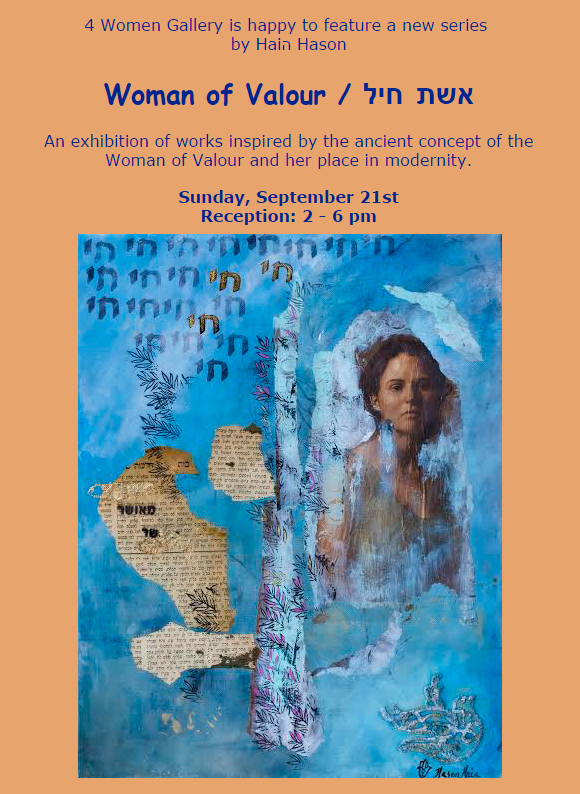 Artist Statement: "The Woman of Valour series (אשת חיל) is one in which I have worked on imagery and artistic material to convey beauty, strength and the place of the woman in modernity. Inspiration for this series was transparent and easy. This is because of the role of the women in my life who while struggling with choices, are encapsulated by love and their connectivity to their Jewish heritage and culture. These notions inspired me to reflect on collective memory that is encoded into our genes of who we are, where we come from, and who we come from. There are many physical layers to most of the works; some are hidden and buried under other layers yet what is seen would not be the same were it not for the unseen. Thus textures and stratus of paper, ink, paint and imagery combine and communicate with each other leading to an integral and hopefully visually aesthetic work. Finally, the works are sealed. Physically this cohesion is in a sense a protection of what was - ancient Hebrew text and its connection to the Jewish home - but as one looks at it, one can also see oneself in the reflection - the present - thereby optimistically looking forward to meaning in the future."